Audrey volunteered at Chow Chilla Wilson Middle School and led 5 classes about the importance of college. 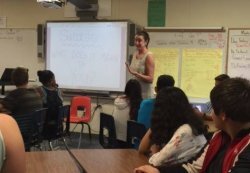 Wilson Middle School Mathematics Teacher Edwin Garcia welcomed Dr. Audrey Nelson as a guest speaker to each of his classes. This is one of many fantastic activities provided to our Wilson students. The site continues to provide fantastic “College and Career Awareness” activities…Go Spartans! !